Victory Guide is award-winning technology that makes it easy for any Democrat, progressive, or left-of-center candidate to run for office and win! Identifies likely voters and determines your target universe of voters. 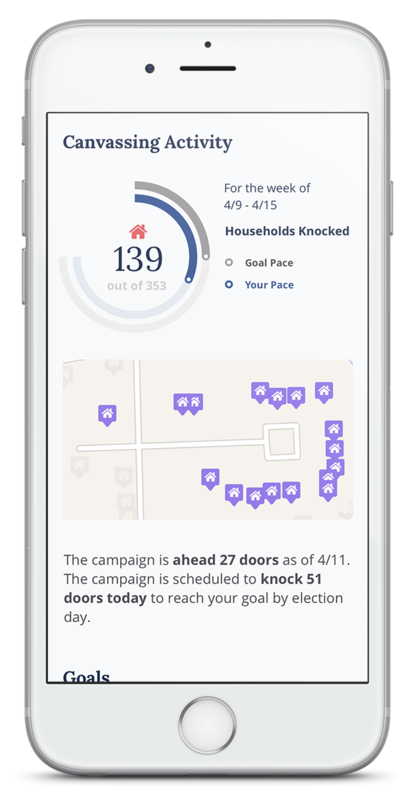 Mobile app to make voter outreach easy through door knocking. See what doors to knock, which voters to talk to, and take notes on each interaction. Calculates how many doors your campaign will be able to knock by Election Day and how many volunteers you'll need. Recommends daily and weekly goals for canvassing. Summarizes your campaign's data into digestible reports. Keeps your campaign organized and on track to win! Candidates for ANC can use Victory Guide for a flat rate of $99 through November 30, 2018. Our easy to use technology makes sure that your campaign stays focused on the most important part of your race: talking to voters. Complete the form below to receive more information about Victory Guide. Sign me up for a risk-free 14-day trial of Victory Guide.